The "red" tilapia has become increasingly popular because its similar appearance to the marine red snapper gives it higher market value. The original red tilapias were genetic mutants. The first red tilapia produced in Taiwan in the late 1960s, was a cross between a mutant redish-orange female Mozambique tilapia and a normal male Nile tilapia. It was called the Taiwanese red tilapia. Another red strain of tilapia was developed in Florida in the 1970s by crossing a normal coloured female Zanzibar tilapia with a red-gold Mozambique tilapia. A third strain of red tilapia was developed in Israel from a mutant pink Nile tilapia crossed with wild Blue tilapia (Popma and Masser, 1999). Jauncey and Ross (1982) found that optimum dietary protein level for fish was affected by balance between dietary protein and energy, amino acid composition, digestibility of dietary protein, the physiological status of the fish and the level of food intake. Fish require energy for growth, activity and reproduction. The rate of energy utilization is called metabolic rate. Factors affecting the metabolic rate in fish are temperature, species, age or body size, activity, physical condition, body functions and water chemistry parameters such as oxygen or carbon dioxide saturation, pH and salinity (Wilson 1977). Providing the exact amount of energy in the diet of fish is important, because if the useful energy is too high the consumption of protein and other nutrients may be restricted and growth is retarded. Furthermore excess of energy may produce fatty fish. This can be undesirable especially if it reduces the dress-out yield and decrease the durability of the frozen fish (Lovell, 1989). On the other hand, when the diet is deficient in energy, dietary protein will be used as an energy source (Cowey, 1980). The more protein is used for energy, the more ammonia is produced, and the more energy is lost as heat (Cho and Kaushik, 1985), consequently, less protein will be retained in the fish body. Therefore, the proper balance between dietary protein and energy is therefore essential in fish feed formulation. The aim of the present investigation is to find the optimum protein and energy (P/E ratio) required for the best growth performance, feed utilization, and proximate analysis of red tilapia fry and fingerlings. The present study was carried out at the Laboratory of Fish Nutrition, Faculty of Agriculture Banha University. Red tilapia fry and fingerlings were obtained from a finfish hatchery owned by GAFRD at Abu Telaat, west Alexandria. Fish were adapted for two months by gradually decreasing water salinity and finally reared in fresh water. For each experiment, 27 rectangular Tank 100×40×50 cm (200 liter for each) were used to represent 9 treatments (3 replicates for each treatment), and each Tank was stocked with 40 red tilapia fry (0.70 - 0.82 g, the first experiment) or 20 fingerlings (9.06 - 9.43 g for the second one). Nine experimental diets were formulated to contain 3 protein levels, 25, 30 or 35%, within each protein level 3 energy levels were tested 2400, 2800 or 3200 kcal ME/kg diet, therefore 9 diets with different protein/energy ratios were obtained and fed to red tilapia fry and fingerlings in two separate experiments. Formulation of the experimental diets is illustrated in Table 1. For the first experiment, fry were given the diets at a daily rate of 20% (during the 1st month) and then gradually decreased to 10%(2nd month). In the second experiment, red tilapia fingerlings fed the experimental diets at a daily rate of 10% (during the 1st month), 7%(2nd month) and 4% (during the last two months) of the total biomass during the experimental period 6 day/week (twice daily at 9.00 am and 3.00 pm) and the amount of feed was bi-weekly adjusted according to the changes in body weight throughout each experimental period (60 or 75 days for the first and the second experiments, respectively). Where:- Ln = the natural log, W1 = initial fish weight; W2 = the final fish weight in "grams" and t = period in days. Moisture, dry matter (DM), ether extract (EE), crude protein (CP), crude fiber (CF) and ash contents of diets and fish were determined according to the methods described in AOAC (1990): dry matter after drying in an oven at 105°C until constant weight; ash content by incineration in a muffle furnace at 600°C for 12 hrs; crude protein (N×6.25) by the Kjeldhal method after acid digestion; and ether extract by petroleum ether (60-80°C) extraction. At the end of the experiment, three fish were randomly taken from each aquarium (9 fish for each treatment) and exposed to the chemical composition of whole fish body according to the methods of AOAC (1990). The statistical analysis of data was carried out by applying the computer program, SAS (1996). At the end of the experiment increasing dietary protein and energy level, contents significantly increased BW and BL, weight gain (WG) and specific growth rate (SGR) of red tilapia fry and fingerlings. These results may indicate that, protein requirements for red tilapia fry and fingerlings reared in tanks lie above 25% crude protein and these results are in complete accordance with those reported by Cruz and Laudncia (1976). They showed that the dietary protein requirements of tilapia for fast growth at a size of 10-30 g lie between 25 to 30%. Viola and Zohar (1984) showed also that, increasing dietary protein level for hybrid tilapia (O. niloticus × O. aureus) from 25% to 30% or 35% significantly increased growth rate. Also, El-Dahhar (1994), found that WG of O. niloticus fry and fingerlings linearly increased with increasing diet crude protein contents. Abdel-Hakim and Mustafa (2000) found that dietary protein requirements for Nile tilapia, O. niloticus reared in cages and depending only on artificial feeds lie between 28-30%. Also, Abdel-Hakim et al., (2001) demonstrated that, increasing dietary protein level from 25 to 30% significantly (P<0.05) increased fish BW, BL and SGR of Nile tilapia, O. niloticus reared in tanks. Also, Wafa (2002) with hybrid tilapia (O. niloticus × O. aureus) and Soltan et al., (2002) with Nile tilapia (O. niloticus) found that, BW, BL and WG increased significantly (P<0.001) with increasing dietary protein from 25 to 30%. Al-Hafedh (1999) found that, SGR of Nile tilapia was significantly increased as diet protein level increased from 25-45% (with increment of 5%). Also, Ogunji and Wirth (2000) with the same fish specie found that, SGR increased with increasing dietary protein level from 7.3 to 44.24%. On the other hand, Clark et al., (1990) found that SGR of Florida red tilapia did not differ significantly when fish fed diets contained 20, 25 or 30% crude protein. Concerning the effect of dietary energy level on average BW, BL, WG and SGRTables 2 and 3 show that, BW, BL, WG and SGR of red tilapia fry and fingerlingssignificantly increased with increasing dietary energy level from 2400 to 2800 and 3200 kcal ME/Kg. These results indicated that, energy requirements for red tilapia fry and fingerlings reared in tanks must be above 3000 kcal/kg diet, excess energy may produce fatty fish, reduce feed consumption (reducing total protein intake) and inhibit proper utilization of other feedstuffs. Therefore, it is critical to obtain the proper protein to energy (P/E) ratio in a diet for the most economical production of tilapia (Shiau and Haung,1990). The greatest final BW (13.41 g), BL (8.57 cm) WG (12.60 g) and SGR (4.68) for red tilapia fry were achieved with the diet contained 35% protein and 3200 kcal ME/kg. This diet presumably contained the most appropriate P/E ratio of 110.3 mg protein/kcal. Also the lower final BW (6.22 g), BL (6.23 cm), WG (5.42 g) and SGR (3.42) were achieved with the diet contained 25% protein and 2400 kcal ME/kg (P/E ratio of 105.6 mg protein/kcal). Similar results were also obtained for red tilapia fingerlings (Table 3) where the greatest final BW (34.67 g), BL (12.01 cm), WG (25.31 g) and SGR (1.75) for red tilapia fingerlings were achieved with the diet contained 25% protein and 2400 kcal ME/kg (P/E ratio of 105.6 mg protein/kcal)., also the lower final BW (23.28 g) , BL(9.59 cm), WG (14.22 g) and SGR (1.26) were achieved with the diet contained 25% protein and 2400 kcal ME/kg (P/E ratio of 105.6 mg protein/kcal). Results obtained in the present study are relatively consistent with Jauncey (1982) who found that, the maximum growth of S. mossambicus was obtained with diets of P/E ratio of 116.6 mg protein/kcal. Mazid et al., (1979) obtained the maximum growth for tilapia zilli fed a diet contained 35% protein with a P/E ratio of 103 mg protein/kcal. Ross (1982) found that, the optimum protein-energy ratio was 78-90 mg protein/kcal for tilapia mossambicus fed 30-35% protein diets and 3836-3860 kcal ME/kg. For Nile tilapia, Soltan et al., (2002) found that the highest BW, BL, WG and SGR were achieved with the diet contained 30% protein and 3000 kcal ME/kg (P/E ratio of 100 mg protein/kcal) and the lowest BW, BL, WG and SGR were achieved with the diet contained 20% protein and 3600 kcal ME/kg (P/E ratio of 55.5 mg protein/kcal). Similar results were obtained with blue tilapia, O. aureus, (Winfree and Stickney, 1981), O. niloticus (Teshima et al., 1985; Siddiqui et al., 1988 and El-Sayed and Teshima, 1992), Tilapia zilli (El-Sayed, 1987), hybrid tilapia, O. niloticus × O. aureus (Shiau and Huang, 1990). Feed intake (FI) during the experimental period were 13.55, 14.90 and 15.71 g/fish for red tilapia fry fed diets contained 25, 30 and 35% protein, respectively with significant differences between these means (Table 4) and the same trend was also observed with red tilapia fingerlings (Table 5) where increasing in dietary protein content from 25 to 30 or 35% significantly increased FI. These results indicated that, as protein content in red tilapia fry diets increased, FI will be significantly increased. 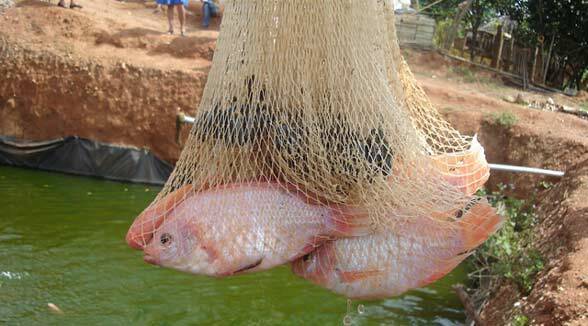 El-Dahhar (2000) reported that, feed consumption increased as dietary protein increased for tilapia fry. Also, Soltan et al., (2002) indicated that, increasing dietary protein from 20 to 25 or 30% in Nile tilapia diets significantly increased feed consumption. On the other hand, Cisse (1996) found that, a change in protein contents from 20 to 30% for tilapia fish did not have any significant effect on the quantity of feed consumed. With regard to the effect of dietary energy content, results presented in Tables (4 and 5) indicated that, increasing energy content in tilapia diets significantly increased FI and this subsequently followed by increase in all growth parameters such as BW, BL, SGR and WG of red tilapia fry and fingerlings. El-Dahhar and Lovell (1995) described that excess energy in tilapia diets may reduce feed consumption. Our results support those of Winfree and Stickney (1981) and Jauncey (1982) in that tilapia regulate their food consumption according to energy intake. For fry and fingerlings red tilapia fed the diet contained 30%CP and 3200 Kcal ME/kg diet (P/E ratio of 110.3 mg protein/kcal) consumed the higher amount of feed whereas fish fed the diet contained 25% CP and 2400 kcal ME/kg (P/E ratio of 105.6 mg protein/kcal) consumed the lower amount of feed (12.15 g/fish). Wafa (2002) found that, hybrid tilapia (O. niloticus × O. aureus) increased with increasing P/E ratio from 80 to 100 mg protein /kcal and decreased when P/E ratio increased to 120 mg protein /kcal. Results of Table (4 and 5) indicated that, feed conversion ratio (FCR) was improved with increasing dietary protein level in red tilapia fry and fingerlings. Siddiqui et al., (1988), Cisse (1996), Abdel-Hakim et al., (2001) and Soltan et al., (2002). Al-Hafedh (1999) came to the same results that FCR of Nile tilapia was improved with increasing dietary protein level. El-Dahhar (1994) found that, FCR was significantly improved with increasing dietary protein level for both O. niloticus fry and fingerlings and the significant improvement in FCR was achieved when dietary protein level increased from 17 to 30% for fry and 17 to 22 for fingerlings. It could be seen that, increasing dietary energy content from 2400 to 2800 and 3200 Kcal ME/kg improved the FCR from 1.91 to 1.73 and 1.67, for fry (Table 4) and from 2.03 to 1.82 or 1.73 for fingerlings (Table 5) for the three dietary energy levels, 2400, 2800 and 3200 Kcal/kg diet, respectively. The diet contained 35% CP and 3200 kcal ME/kg (P/E ratio of 110.3 mg protein/kcal) showed the best improvement on FCR (1.25 and 1.54) and the diet contained 25% CP and 2400 kcal ME/kg diet (P/E ratio of 105.6 mg protein/kcal) showed the worst values for FCR (2.39 and 2.24) for red tilapia fry and fingerlings, respectively. These results mean that, the diet with P/E ratio of 110.3 mg protein/kcal considered as the most suitable diet tested in the present study for tilapia fish. Wafa (2002) found that, hybrid tilapia (O. niloticus × O. aureus) fed the diet with P/E ratio of 100 showed the best FCR (3.22) followed by those fed the diet contained 80 mg protein/kcal ME (3.27) while fish fed the diet contained 120 P/E ratio recorded the poorest (P<0.05) FCR values (3.44). Also, Soltan (2002) found that the best FCR was obtained with tilapia fish group fed an experimental diet contained 30% CP and 3000 Kcal ME/kg diet (P/E ratio of 100 mg protein/kcal). As described in Tables (4 and 5), averages PER were significantly different and being 1.79, 1.70 and 1.98 for red tilapia fry and being 1.81, 1.67 and 1.83 for fingerlings fed the diets contained 25, 30 and 35% crude protein, respectively. Results of PER indicated that, increasing dietary protein significantly increased PER for red tilapia (Table 4) while PER had no clear trend in fingerlings. Abdelhamied et al., (1997) and Twibell and Brown (1998) found that, PER was unaffected by increasing dietary protein from 25 to 35% for O. niloticus. On the other hand, Siddiqui et al., (1988) found that, PER decreased with increasing diet protein level from 20 to 50% for Nile tilapia. Also, El-Ebiary (1994) found that, increasing dietary protein level up to 35% and feeding rate up to 4% decreased the values of nutrients (protein and energy) utilization in Nile tilapia and its hybrid. Increasing energy content of red tilapia fry and fingerlings from 2400 to 2800 or 3200 kcal/kg diet significantly (P<0.05) increased PER of red tilapia fry from 1.70 to 1.88 and 1.89 (Table 4) and from 1.61 to 1.81 and 1.91 for fingerlings (Table 5). PER values were improved for fry and fingerlings fed the diet contained 35% CP and 3200 kcal ME/kg diet (P/E ratio of 110.3). Wafa (2002) found that, hybrid tilapia (O. niloticus × O. aureus) fed diets contained 80 or 100 mg protein/kcal recorded the same (best) PER (1.14) whereas, those fed the diet contained 120 mg protein/kcal showed the poorest PER (1.04). Soltan et al., (2002) reported that, the best PER for Nile tilapia was recorded for fish group fed the diet contained 30% CP and 3000 Kcal ME/kg (P/E ratio of 100) and the lowest was recorded for the diet contained 25% CP and 3000 Kcal/kg (P/E ratio of 81.7). As shown in Table (6) moisture content of fry at the end of the first experiment ranged between 70.88 and 72.99% and the differences between these percentages were not significant. It is observed also that, increasing dietary protein level from 25 to 30 and 35% significantly decreased protein contents in whole fry bodies from 54.65 to 51.99 and 48.12, and significantly increased fat content from 30.24 to 30.84 and 35.53% (Table 6) and the same trend was also observed for red tilapia fingerlings where increasing dietary protein significantly increased protein and decreased fat content of red tilapia fingerlings (Table 7). In general, fish fed the high protein diet gained the highest crude lipid content in their bodies which can only be explained by an imbalance in the diet. Similar results were obtained by Abdel-Hakim et al., (2001) who found that, increasing dietary protein level from 25 to 30% decreased the percentages of protein from 55.58 to 52.24%. Also, Al-Hafedh (1999) found no significant influence of dietary protein level (25 to 45%) on body protein content of Nile tilapia but the lipid content decreased with increasing protein level and no clear trends in ash content were observed. As described in Table (6) it is observed that increasing dietary energy content from 2400 to 2800 and 3200 kcal ME/kg diet significantly decreased protein and ash but increased fact content of red tilapia fry fed the experimental diets for 8 weeks and the same trend were also obtained for tilapia fingerlings fed the same experimental diets for 10 weeks (Table, 7) and these results were supported by Buckely and Groves (1979), Shiau and Huang (1990) and Soltan et al., (2002). They found that, body lipid increased as dietary energy increased while the moisture, protein and ash contents decreased. Similar results were also reported with Mozambique tilapia (El-Dahhar and Lovell, 1995). Protein content in whole fish bodies ranged between 55.34 to 59.34% and fat ranged between 25.33 to 30.44% and ash ranged between 12.23-15.44% for red tilapia fry fed the different experimental diets that contained different P/E ratios (Table 6). The different experimental diets that contained different P/E ratios also had a significant effect on the percentages of protein, fat and ash content of red tilapia fingerlings (Table, 7). It could be concluded that diet containing 35% crude protein and 3200 kcal ME/kg (P/E ratio of 110.3 mg protein/kcal) considered the most suitable diet for red tilapia fry and fingerlings reared in tanks.